Earlier this year, I spoke about how I found my signature perfume and I can say ten months later that I added 4 new gems to my collection that I love just as much if not more. However, I will speak about just one perfume that I bought when I was in Germany last month and I will tell you what I like so much about it. Recently, my friend Gabriele made a vlog about her beauty favorites of the month, and mentioned Marc Jacob's Decadence perfume, which I realised I have never even smelled before although it's been out for quite some time now. It reminded me I should visit perfume stores more often but that would leave a big damage on my bank account every time and that is not a good idea. Back to my signature perfume, since at the beginning of the year I wouldn't have predicted my life will change so much, I didn't know that my then beloved Jo Malone's Amber & Patchouli Cologne will smell so different in a warm climate. As you know, I purchased it in winter time and I think that's the season it smells best. And as you are aware, there is no such thing as winter in Dubai, so that's why it is collecting dust until I'll bring it with me to colder regions on layovers. I'll share a little secret of mine - I'm an avid user of this website called Fragnatica, which I highly recommend if you wanna know everything about perfumes. It always helps me when deciding if the perfume I like is a worthy investment or not, plus I enjoy reading other people's feedback on that particular fragrance. So let's get into detail about this new favorite of mine. 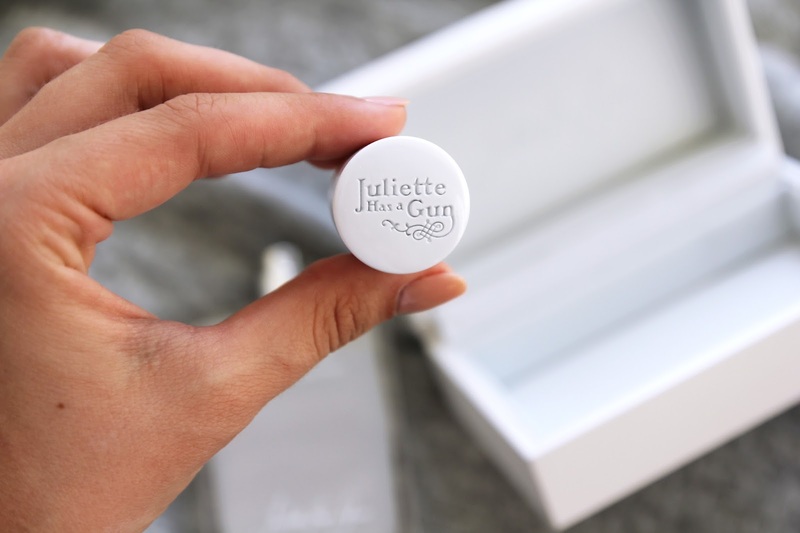 Juliette Has a Gun is a brand behind this new perfume I adore called 'White Spirit'. This brand has limited distribution - only in concept stores and specialized perfumeries, therefore wearing their perfumes gives that extra luxury feeling that not everyone will know or own the perfume. That's something I personally enjoy in general about perfumes, and that's why I always do a lot of research before I purchase one. To make a long story short, let's talk about the perfume itself. 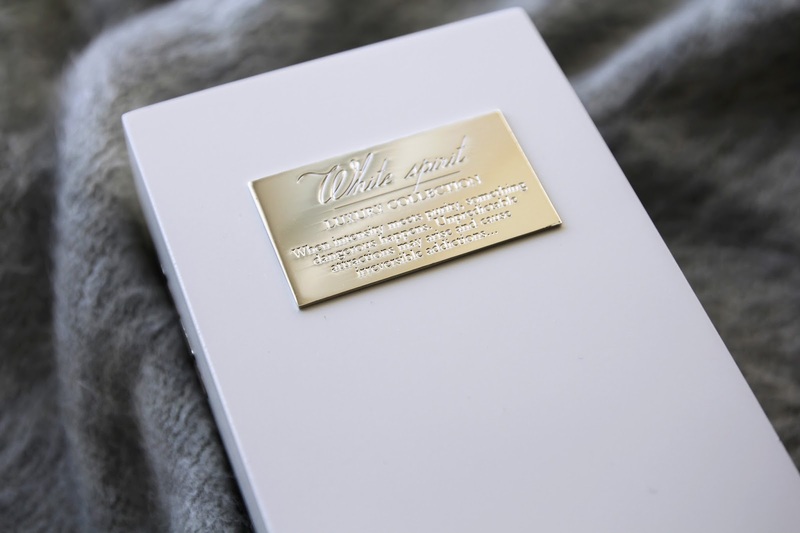 Not to mention the beautiful box, I really love the description of White Spirit that is engraved on the metal tag on top of the box. This is what it says: 'When intensity meets purity, something dangerous happens. Unpredictable attractions may arise and cause irreversible addictions...'. Now if this is not an intriguing perfume description, I don't know what is. I won't really talk about in detail about the smell itself, as all of that info is available on Fragnatica if you want to find out. But I guess I'll just finish off by saying, yet another perfume in my collection that contains amber in the ingredients. There is just some kind of love affair between me and perfumes with amber, I simply adore them. Next on my perfume wishlist is probably Tom Ford, I've been always intrigued to try them. What's your favorite perfume at the moment? Disclaimer: this post is not sponsored and all opinions are my own. I've tired this perfume before. It's so great!